The B-Line Trail is 3.1 miles long and features a 12' wide asphalt surface that is ideal for recreational as well as commuter use. It is wheelchair accessible with numerous pieces of public art, three fitness stations, at-grade street crossings and large plazas suitable for public gatherings. The trail is lighted at night, and two attractive, pedestrian bridges over busy thoroughfares encourage pedestrian safety. Interpretive signs along the trail's length chronicle its history as a former railway. Location: Begins just east of Adams Street on the north side of Bloomington, Indiana. The B-Line Trail runs south through the heart of downtown to Country Club Drive on Bloomington's south side. From Indianapolis, take IN-37 South for about 42 miles. Turn east on West Vernal Pike to 11th Street. Continue east on 11th Street to North Adams Street and the B-Line trail head. There are many additional access points between Adams Street and Country Club Drive. The B-Line Trail, created from a former railway corridor, extends a total of 3.1 miles from the east side of Adams Street through downtown Bloomington and the former railroad switchyard to the north side of Country Club Drive. The trail connects to the Bloomington Rail Trail, which connects to Clear Creek Trail and provides trail users with more than seven miles of connected, City-owned and City-maintained trails. The B-Line Trail's location, through the heart of Bloomington, supports economic enhancement by offering local businesses new opportunities to reach a new market share. Significant public art and a large blue diamond bridge spark creative vibrancy in the downtown section of the trail, which also incorporates design features such as paver treatments at each street crossing, a human/pet drinking fountain, park benches, shade structures, limestone accents, trees and landscaping. The B-Line Trail, which is wheelchair accessible and free to use, is an ideal place for people of all ages and abilities to walk, run, bike, skateboard, stroller walk, in-line skate and otherwise engage in healthy, active lifestyles. The provision of fitness stations along the trail was funded by IU Health Bloomington. The three fitness stations include five different apparatuses, all of which can be combined for a total-body workout: balance, upper body, lower body, abs and stretching. Placards next to each station provide safety and usage instructions for each piece of equipment. Four plazas, located at key cross streets along the trail in the downtown area, provide gathering places that present opportunities for theater, music, speeches and public art. The plazas were made possible through the sponsorship of local organizations, including the Bloomington Board of REALTORS. 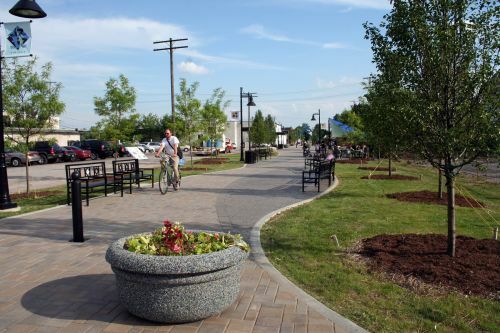 The B-Line Trail provides not only space for recreational, fitness, economic development and community activities, but provides all these things in a beautiful, aesthetically pleasing way. Sculptures and murals by regional and local artists, limestone accents (courtesy of the area's limestone quarries), trees, and landscaping are all included as attractive accents. "Animal Island" was created by clients and staff of Stone Belt Arc, a local nonprofit that provides education and support to persons with disabilities. "Bloomington Banquet," the B-Line Trail's signature art piece, is a limestone sculpture by local artist Dale Enochs. It represents the human need for nourishment (the Bloomington Community Farmers' Market is held each Saturday next to the B-Line Trail and the sculpture), and is a tribute to the renovated Showers Brothers Furniture Factory, a historic building beside the trail that today serves as Bloomington's City Hall. "Dancing Spirit" is a kinetic metal sculpture created by local artist Mark Wallis, and donated by Cem and Vicki Basman in memory of local musician Evan Farrell. The "Figured Base" limestone sculpture by Michael Van Vooren conveys the message that Bloomington is a community where artists of all genres lend support to one another to enrich the lives of many. The "Grass" metal sculpture by Bloomington artist Lara Moore is located on the trail-facing side of the Bloomington Convention Center, where both the sculpture and the trail are enjoyed by visitors attending weddings, conferences and other events. "Worlds Apart-Always Connected" is a colorful trail-side mural by students from San Juan la Laguna, Guatemala, who participated in the "Art Across the Americas" exchange program. Another mural, dubbed "Our Hometown," was created by members of the Boys & Girls Club of Bloomington summer program. This mural represents the playfulness and diversity of Bloomington. Each piece of art is strategically placed along the trail to maximize user enjoyment and interaction. Along with the artwork, landscaping adds to the experience. Large flower pots along the trail, sponsored by local businesses, feature attractive and easy-to-care-for seasonal and colorful foliage and flowers. During the spring, summer and fall, a full-time trail maintenance specialist works the entire 3.1 miles of the B-Line Trail to empty trash and recycling receptacles, remove graffiti, touch up paint, sweep street crossings, pick up litter, and report maintenance issues. In addition, City police patrol the trail via Segway, ATV, bicycle and on foot. Their reassuring presence helps trail users feel comfortable on the trail, which in turn helps reduce incidences of vandalism. During the winter months, trail crews keep the popular thoroughfare cleared of ice and snow. 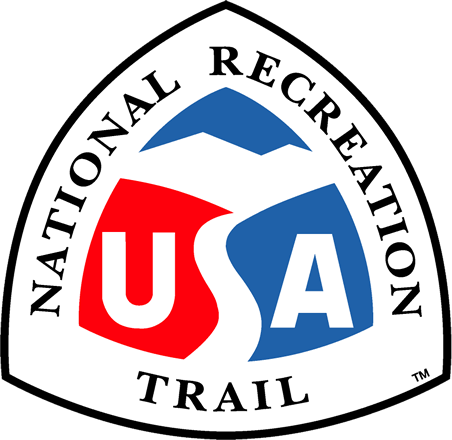 To enhance user comfort and to entice trail users to linger and enjoy the trail, several park benches, picnic tables, shade structures, a human/pet water fountain, LED lighting and bike racks are located along the length of the trail. The "B-Line Backer" program allows area companies that want to support the trail and promote their businesses to do so by sponsoring benches, flower pot plantings, tree plantings and more. Current park bench sponsors include Twisted Limb Paperworks, Indiana University Kelley School of Business, Indiana Research Center and author Karen Kingsbury.